As of December 26, 2018, India saw 93 attacks motivated by religious hatred. Minorities were the victims in 75% of the incidents. Mumbai: With 93 attacks as of December 26, the year 2018 saw the most hate crimes motivated by religious bias in India in a decade, according to Hate Crime Watch, a multi-organisation effort steered by FactChecker.in, in collaboration with Aman Biradari, a people’s campaign for secularism, justice and compassion based in New Delhi, and NewsClick.in, a public-interest journalism non-profit. In 75% of these incidents, minorities were victims. In 2018, 30 people were killed – the most since 2009 – and at least 305 injured in such attacks. While the year 2018 recorded one death more than the previous year, which had 29 deaths, there were over twice as many non-fatal injuries in 2018 compared to the previous year. Hate Crime Watch does not aspire to be an exhaustive record of all hate crimes in the country. We are merely hoping to document the rising incidence, and any related patterns that emerge, so that the state takes notice and begins documenting such crimes. Yogi Adityanath’s Uttar Pradesh had the highest number of such attacks (27), followed by Bihar (10), which has a coalition government of the Bharatiya Janata Party (BJP) and Janata Dal (United). Rajasthan and Gujarat – under BJP governments at the time – and Karnataka which has a coalition government of the Congress and the Janata Dal (Secular), followed with seven incidents each. Uttar Pradesh and Rajasthan had four deaths each in such attacks. Karnataka and BJP-run Jharkhand followed with three deaths each. Of 81 incidents in 2018 in which the religion of the victim was known, 60% (49 attacks) involved Muslim victims and 14% Christians. A Sikh was the victim in one incident. This means that minorities were victims in 75% incidents in 2018. 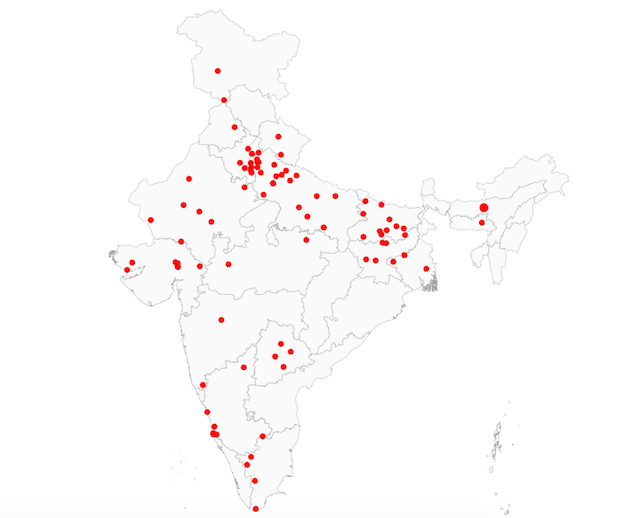 Hindus were the victims in 25% or 20 attacks this year, our database shows. In all, Hate Crime Watch has recorded 280 incidents since 2009 – the start point of the database – leading to 100 deaths and at least 692 injured. Overall, since 2009, Muslims, accounting for 14% of the population, were the victims in 66% attacks. Christians, accounting for 2% of the population, were victims in 17% attacks, and Hindus, accounting for 80% of the population, were victims in 16% incidents. In 32 cases (11%), the religion of the victim was not reported. In 2018, of the 30 deaths recorded in hate crimes motivated by religious crimes, 60% or 18 victims were Muslim, 33% or 10 victims were Hindu and 7% or two victims were Christian. Overall, since 2009, of 100 persons killed in such attacks, 65 were Muslim, 27 were Hindu and four were Christian, our data showed. Of 63 attacks in 2018 where the religion of alleged perpetrators was known, 45 attacks (71%) involved Hindus as alleged perpetrators and 17 attacks (27%) involved Muslims. Overall, since 2009, 156 of 191 attacks (82%) involved Hindus as alleged perpetrators, and 33 attacks (17%) involved Muslims. The religion of the alleged perpetrators was not reported in 89 cases. One in four incidents of hate crime sparked by religious bias this year was a communal clash, our analysis showed. While interfaith relationships were the pretext of attack in 16 cases (17%), 14 cases (15%) were under the pretext of cow protection. In 24 cases (26%), the pretext for the attack was unclear–they involved incidents such as vandalism at religious shrines and attacks with no apparent provocation, while some others listed reasons such as allegations of theft, and revenge. We listed the pretext for these incidents as ‘Other’. Overall, since 2009, 75 attacks (27%) were under the pretext of cow protection, 40 attacks (14%) were under the pretext of interfaith relationships and 26 attacks (9%) were under the pretext of religious conversion.